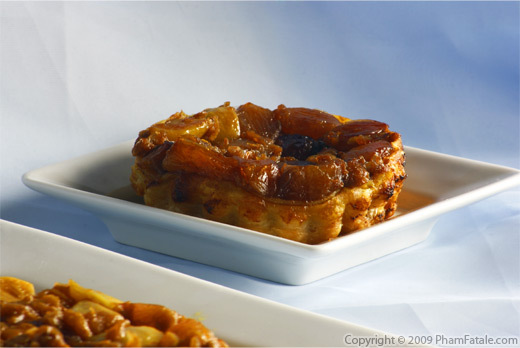 The tarte tatin (upside-down tart) was originally made with caramelized apples. It was created by the Tatin sisters at the beginning of the century. The two demoiselles Tatin, Fanny and Caroline, ran a little eatary in a hotel in Sologne, in the countryside of France near Orleans. They were famous for their apple tarts. 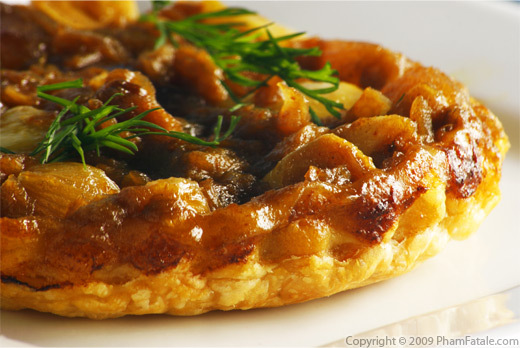 One day, one of the sisters clumsily forgot to place the puff pastry dough and put the caramelized apple layer first and that's how a fortunate mistake created the trendy dish. A French way to make an onion confit would be with caramelized onions that were previously boiled in milk but I had some leftover curried pearl onions called do-pyaaza. 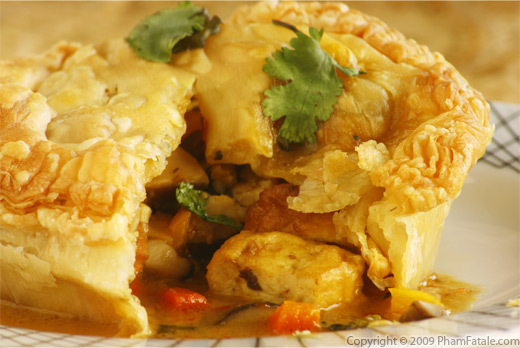 It's cooked in a generous amount of ghee, yogurt and flavored with ginger-garlic paste and several Indian spices. 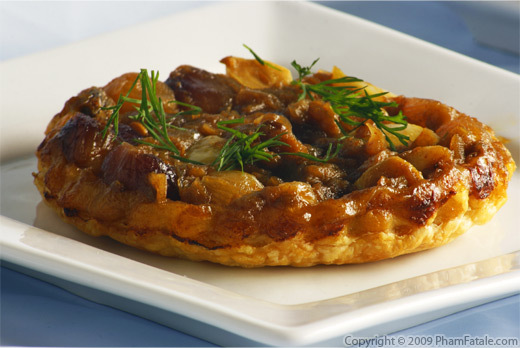 My fusion result is called a tarte tatin de petits oignons perlés à l'Indienne. Cook the finely chopped shallots in canola oil in a deep skillet over medium low heat, stirring frequently, for about 5 minutes. Add the halved garlic, tumeric power, ginger-garlic paste, paprika. Cook for another 2 minutes until the garlic is slightly golden. Then add the cumin seeds, coriander seeds, black peppercorns, the two types of cardamoms, cloves, the small cinnamon stick and dried and fresh whole chiles. Add the ghee and the pearl onions. Cook at a bare simmer, stirring occasionally for about 12 minutes. Mix all the ingredients with yogurt, add a little bit of the water and keep stirring constantly. Cover with a lid. Let simmer for another 5 minutes. Check the liquid and periodically add the rest of the water when the liquid is reduced. Add the nutmeg, cayenne powder, the mustard seeds and the Dijon mustard to make a smooth coating over the pearl onions. Season with some fleur de sel and the curry powder. Cook about 2 minutes longer, the texture of the pearl onions should be soft but still firm. Remove from the stove and let the mixture cool down. Coat 6 mini tartelet shells with a thin layer of butter. 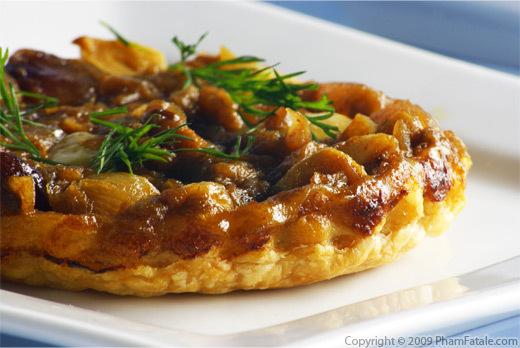 Cover the pie shells with tighly packed curried pearl onions. 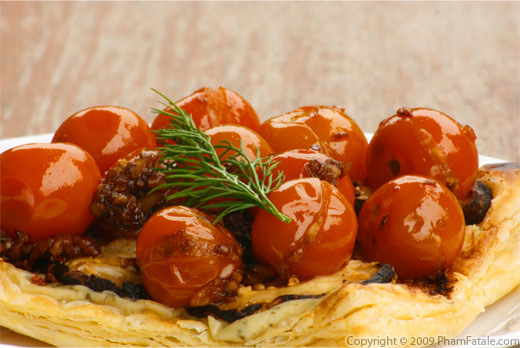 Cover with the puff pastry. Remove the excess puff pastry on the sides. Dock the dough using a fork. Bake the pastries in the oven for 15 minutes. Flip each tartelet individually on a plate right away (don'twait too long otherwise the onions will be stuck to the pie pan) and serve warm. 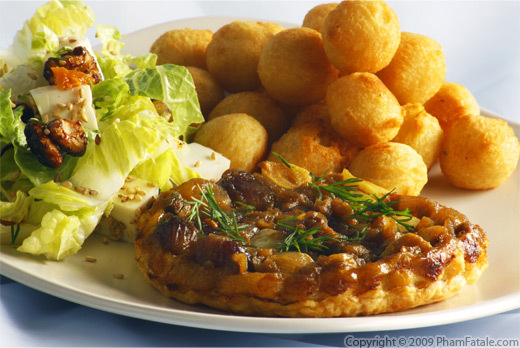 I served the pearl onion tarte tartin for lunch accompanied with a fresh garden salad (lettuce, Indian sesame cheese and candied walnuts) and some crispy pommes noisettes (the French version of tater tots). 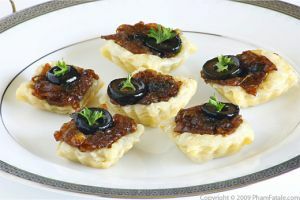 If you're throwing a fancy dinner party, serve it as a first course and drizzle the tartlets with a little wine reduction or my molasses-balsamic syrup reduction that I used for the Inaugural Luncheon. If you want to save some time, you can use frozen pearl onions that you previously thawed. I find the texture to be slightly different. The frozen ones release their water and shrink in size, whereas the fresh pearl onions have a better consistency. You can make your own ginger garlic paste. 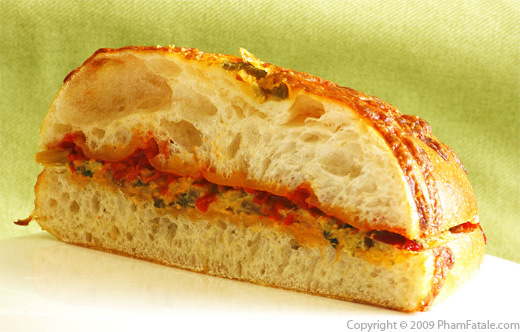 It tastes great and is very healthy for you as well. Just clean the ginger and remove any dirt. Peel the ginger root with a paring knife, then finely chop the root. Place the chopped ginger and 5 cloves of garlic in a blender, add about 2 tablespoons (or more) of water for a smooth flow. Transfer to a jar and store in the refrigerator. You can keep this paste for at least a week in the refrigerator. An easy way to peel pearl onions is by blanching them. Place the whole onions in a saucepan filled with boiling water and cook for about 3 minutes. Drain the onions and transfer to a bowl filled with ice cubes and cold water. Let them sit for a few minutes until the onions are cool. Drain the onions and you'll see it's much easier to peel them. I used the long dried red chili that Lulu planted last summer. They are very spicy so I placed only one dried red chili. You can add more depending on your tolerance to spicy food. 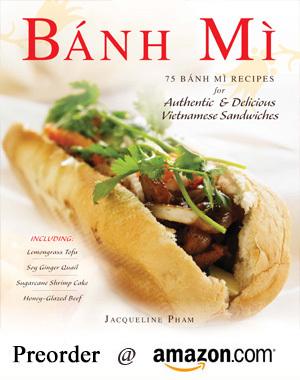 Published By: Jacqueline Pham on March 4, 2009.
found your site on foodgawker, and I have to say that sounds incredible. Oh my my. This looks amazing. 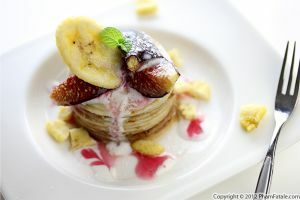 Even though I am a sweet person through and through, this looks amazing. Thanks for pointing it out to me! 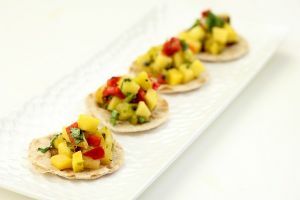 I'm always happy to find a wonderful diverse food blog. We are American & Japanese family who has lived in Europe and Japan. I feel welcome.